However, seeing the documentary opened up a different angle to the attacks and to people’s responses to them, and that was the human angle, the human story. Which is to say, because the attacks took place over a sustained period -- it was a three day period -- it wasn’t like other terror attacks, where there might be a bomb blast, or shooting, and it’s jarring, and it’s violent, and it’s over, and you’re dealing with the aftermath. In the case of the Mumbai attacks, over 68 hours meant that the human response quite different; meaning that because Mumbai is such a huge city, and because it took time for the police to be able to neutralise the situation, a lot of people caught up in the attacks had to rely on themselves and one another to get through this ordeal. AM: Over the course of about 12 months, we conducted our sort of research -- it was ongoing, as we were making the film, because as you make it, more and more stuff feeds in -- but it started with a friend of mine who is a lawyer in Australia, Brian Hayes, he’s since become a co-producer on the film. Specifically, I was after the court case transcripts of Mohammed Kasab, who was the sole surviving terrorist. These documents are publicly available, but in Australia, you can get the judgments, but to get the entire transcript can be difficult. So, Brian helped to source and introduced us to both the prosecutor, the defense counsel, and he also knew the judge in the case, but it was the defense counsel that directed us to where we could find the court case transcripts, and within them was thousands of pages of the confession of the gunmen, together with a lot of other circumstantial evidence, including these satellite phone calls that were intercepted by the Indian security services. These were calls that were made between the gunmen and their handlers back in Pakistan, and that give a blow-by-blow account of what they were saying to one another, and what they were being told by their handlers, and some of that interaction made its way into the film. 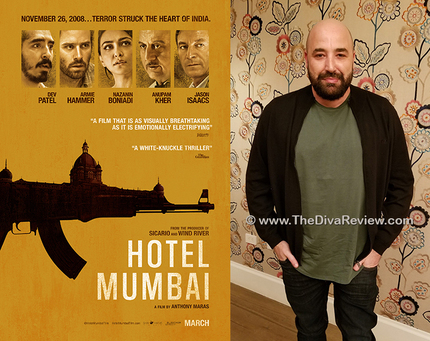 It happened to be at the Taj that there were Islamic terrorists who had done this; but I think the film is really about people from all walks of life coming together. Within the Taj, there were people of all ethnic and religious persuasions, and you had people of the Muslim faith, of the Christian faith, and the Hindu faith, coming together within those walls to survive against extremism. And so, the film is a plea for peace, and it’s a major indictment against using violence. Again, our heroes never throw a punch, never fired a shot; they are heroic in how they showed calm and unity. AM: Of course. The Taj Hotel has Sikhs as doorman, as ceremonial guards throughout all their hotels. They are traditionally, historically, a warrior class. At all the hotels, you will see men with the dastar and the beards at the front. I personally felt, after Dev’s idea, actually, that to show to not judge a book by its cover; and there were incidents after 9/11, and after that, there were people were sort of praying and attacking Sikh Indians in response to Muslim attacks. The David character was based on real life persons; a husband and wife, who wanted nothing more than to survive this, so that their child wouldn’t become an orphan. And even though they wanted more than anything to be there for one another, had they been in the same physical proximity, there would be a greater risk of both of them dying. So, they had a really impossible decision to make; which was separate and have a chance that one of us lives, or be together and a greater chance that if the floor above them caves in from a bomb, or if someone comes through the door and shoots, then their child becomes an orphan. AM: Several people have seen it. We had Hemant Oberoi see it prior to the Toronto screening. I was very nervous about how he’d take it, because obviously, you put your heart and soul into this and try and do justice to their stories, but ultimately, the response they’re gonna have is the response they are gonna have. I called Oberoi shortly afterwards, and he said, “This has captured what it felt like for me to live through these attacks.” Then, he was our special guest at the Toronto film Festival, and you can see online, where there was a standing ovation for him.